Super portable, excellent sounding acoustic guitar amp that you can also sing through. Pro all the way. Crystalline sound quality. Very well put together. Good balance of features and functionality. It will only sound as the guitar, pickup and playing you put into it! There comes that sinking feeling in every acoustic player's life when the penny drops and you realise you need an acoustic guitar amplifier. If only it were just a penny that you needed to drop: in reality, it's pounds, hundreds of 'em. The decision usually comes about after a period of tediously terrible monitors gig after gig and/or frustration at being drowned out by the rest of the band. It might also be that you need to be able to power your own performances entirely or maybe, just maybe, you actually want to sound better. Germany's AER has been making amplifiers to help with all those problems for a little over two decades. The company takes a highly technological approach to design and manufacturing, albeit fired by a core belief that the ultimate goal is to make tools for musicians to just get on with playing. The amp we have here is the latest iteration of the class-leading Compact 60 - now in '3' form. Aimed at single musicians who want to amplify an acoustic instrument with a pickup (electro, mandolin, and the like - even archtop jazz guitars), and need a separate mic channel for vocals or instruments. Inside is a DMOS, monolithic IC power amplifier and one dual-cone speaker and amplifier, for an output of 60 watts. So far so good, but as ever with wattage and guitar amps, the numbers rarely give any meaningful indication of volume. 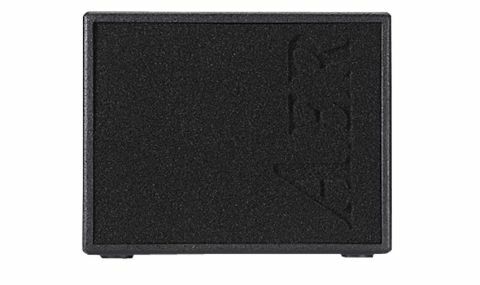 "The Compact 60 3 will stand up just fine as an acoustic guitar amp in a normal pub/club band scenario"
What's interesting in AER's case, proven over many versions of its amps, is that its dynamic power amp control, using a complex system of filters and limiting, puts those watts over in an incredibly efficient manner, sounding super clean and clear all the way: the Compact 60 3 will stand up just fine as an acoustic guitar amp in a normal pub/club band scenario. Underneath the very modern looking, tough black acrylic coating, the cabinet is actually birch ply, not particleboard. While being a better choice for sound in AER's opinion, it also helps keep the weight down to just 6.5kg. In fact we recently did a video feature with jazz guitarist Jim Mullen, who arrived on the bus with his Aria archtop and a Compact 60 over his shoulder. Now that's portable. Another big plus in any one-box amplification solution are in-built effects. Thus the Compact 60 3 has a simple, but very high quality digital effects engine offering up two reverbs (short and long), a 320ms delay and a chorus. It seems slightly odd to limit the￼￼￼ ￼delay to one timing, but it's nevertheless a good all-round choice if you had to pick just one! Helpfully, there's an efx-pan control enabling you to have effects in whatever proportions you like on either both, or just one channel. Less obvious here is that with the internal effects level at minimum, the external effects you have in the amp's loop will still be heard. The Compact 60 is straightforward in terms of what to plug in where - guitar in channel one for the most part, mic into channel two. Every input has a corresponding gain control to set your ideal input levels and the various bass, treble and mid pots do exactly what you'd expect. Less obvious is the 'colour' button that appears in channel one. It changes the midrange response considerably which can be useful depending on what kind of instrument/pickup you're using, and indeed to suit different playing styles that either need to cut through, or sit back in a mix. "We took the amp on a variety of gigs and found the onboard EQ more than capable of dialling in the sound we wanted"
There are no parametric EQ controls, it's interesting to note, so if you do have a very specific troublesome feedback frequency, it'll need to be dealt with elsewhere. That said, we took the amp on a variety of bigger- and smaller-room gigs and found the onboard EQ more than capable of dialling in the sound we wanted, without any significant feedback problems when using a variety of common under-saddle and soundhole pickups. The amp also has an XLR input/channel in addition to the expected 6.3mm jack. Optimised for mics or line-level sources, it means you can plug in pretty much anything, including microphones, preamps, DIs or what have you, for full-range sound reproduction. Phantom power at +48 volts is also supplied if you want to use a condenser/capacitor mic for singing or instruments. However, it's turned on as a factory default, meaning that your mic must be able to cope with it - do check with the manufacturer before plugging any mic in! It's also worth mentioning that the jack input can be supplied with phantom power if your guitar can take it. A qualified tech needs to switch this on inside the amp. It's also worth noting that the DI out happens before the effects sections (so there are no effects in your DI), though it does include your EQ settings. If you want effects included in your direct output, use the line out jack socket. It sounds more complicated than it is; the more important point is that it's great to have plenty of options, depending on what the out-front engineer wants. In addition, there's a direct output for a tuner, headphones (main speaker is muted), plus a send and return loop for outboard effects. A strange omission though is the lack of CD/MP3 player input option. Plugging in a couple of electro-acoustics - one with a Fishman under-saddle system and the other with Taylor ES1 - the first impression is of a modern, hi-fidelity presentation. The onboard EQs are powerful as overall shaping devices, but you get the feeling that an AER amp isn't designed to 'colour' the sound in the way that an electric guitar amp would do. No, this amplifier is presenting what it 'hears' from the guitar in as clean and natural way as possible. "This amplifier is presenting what it 'hears' from the guitar in as clean and natural way as possible"
That's a double-edged sword, of course, because if you have a rudimentary pickup system that sounds harsh and unnatural, there's not a great deal the AERs will do to 'save' it. Conversely, the level of dynamic range and sheer frequency response does give high quality pickup systems the best chance possible of sounding natural; if you put up a high quality condenser mic, for example - sing through it or play your guitar - you'll hear the AER's inherent quality, loud and crystal clear. Don't be scared of that high end, either. When playing in a band, or using the amp as a small PA, those are the frequencies that will get you heard clearly and with high fidelity. Engaging the colour control ushers in a dollop of lower-mids that can add plenty of girth to fingerstyle playing, and serve to lessen the impression of the crystalline high end. You might find that it's a step too far with certain soundhole pickups, but a real boon for thinner- sounding piezos. Being totally reductive, you might even say it sounds more 'vintage'. The Compact 60 3 may be one of the smallest amps in the AER range, but it will still surprise you; on more than one gig we were asked the question, 'Is all that really just coming out of that tiny box?' to which the inevitable answer was a slightly smug 'yes'. Effects add a very welcome ambience to proceedings, underlining the 'modern' nature of the sound with a generally lush, deep reverb that flatters vocals as much as solo guitar. You might bemoan the lack of editability, but we'd say AER has struck an ideal balance of simple usability and sound quality. If you want something more specific, there's always the effects loop. The Compact 60 3 is a very simple proposition that neatly answers the question, 'What is the best-sounding, most portable, professional standard acoustic guitar amplifier I can buy?' It's that straightforward, and the list of professional players who choose it only serves to underline the point. Apart from the price - we're into serious/ pro territory - the biggest hurdle to get over with this amp is the physical size. The diminutive dimensions might kid you into thinking this box will be lacking in power or volume, but not a bit of it: the Compact 60 3 will surprise you with the size and spread of its projection. Do you need an acoustic amp? Play one of these and find out!